Nomad 900X. Photo: © Trimble. Q: Trimble is a global company with many different arms in different areas, can you talk to us about your Defense arm and your capabilities? A: Trimble Mobile Computing Solutions (MCS) is a division of Trimble Navigation Limited, which is a global company providing technology to construction, agriculture and infrastructure such as transportation and utilities. The technology used by these industries is also of value to the military, both because it helps soldiers in the field with position, communication and infrastructure, and also because everything Trimble makes is rugged and designed to be used in the most difficult conditions. Q: Ruggedised equipment is expected to operate to higher standards and to be more protected against both the elements and the user, could you explain Trimble computers and where they differ from other market options? A: All Trimble computers, handhelds or tablets, are designed to be rugged from the inside out – even their chipsets are rugged. 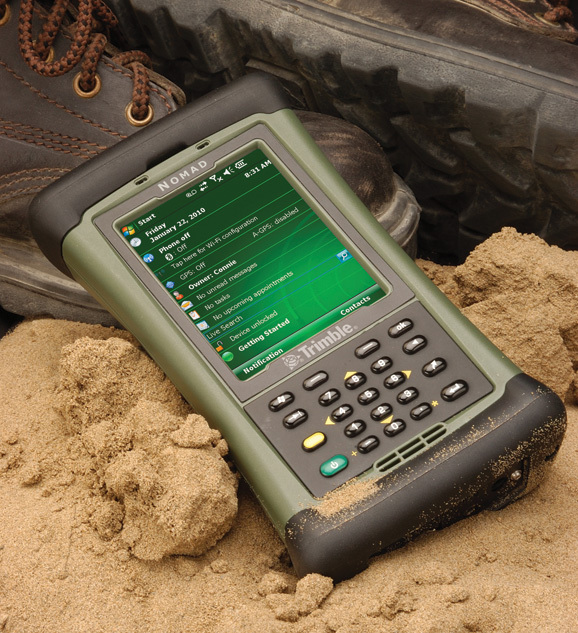 Unlike a consumer device like a smartphone or tablet with an outside shell that might protect against a few drops to the ground or a spray of water, Trimble handheld computers are tested to the latest military standards to keep working through high heat, humidity, salt water, dust, vibration, shock and other extremes. They are able to handle multiple drops, hard rain or water immersion and keep working in the field. They also have long battery lives and optional external batteries that can be changed out in the field so there’s not a worry about crucial communication devices going dead. The Yuma 2 rugged tablet computer contains a unique display technology that gives full readability even in direct sunlight. Many competitors claim sunlight readability but in glaring sun the screen will darken. Not so with the Yuma 2. In the desert, in the jungle, if the sun is shining directly over the shoulder of your soldier he or she will still be able to access orders or maps, collect valuable data, and take and see photographs and video. The Yuma 2 also comes with an option for enhanced GPS for 1-2 meter accuracy. There’s no better rugged tablet made for today’s soldier. Q: With a major emphasis being placed on multifunctional devices to lighten load and for effective power usage how are these products helping achieve these goals? A: Long life battery and light-weight computers that can be easily carried are part of the standard Trimble requirements when we build our mobile field equipment. All of our computer products not only have built in extended-life batteries, they also have extra battery pack options for changing out in the field when necessary. They also have docking stations that can not only charge back at base, but at the same time connect the handhelds to office systems for the most secure data sync. Trimble computers work with Microsoft® Windows software and the Juno T41 also offers an Android version. Soldiers in the field can stay completely connected with Command and Control with the wi-fi Bluetooth® and even voice and data capabilities of these innovative computers. Q: Could you if you can talk to us about who are using the devices and how they are being assimilated into existing kit for interoperability? A: Trimble products are being used by all branches of the United States military and by NATO countries. Besides the handhelds from Trimble MCS, products such as survey equipment systems, unmanned vehicles, robotics and many rugged equipment components are part of Trimble’s contribution. Because Trimble is a global company comprised of dozens of divisions, the innovation to put together almost any solution is inherent in what the company offers. From hardware, software, and specific-purpose firmware, Trimble technology crosses many defense workflows. Trimble MCS can provide handheld computers and work across the full company to bring targeted solutions for specific customer needs. Q: Where do you view yourselves in the next year and are there any landmarks coming up? A: We have some exciting new technologies coming that should be of great interest to the defense community, but we are not quite ready to talk about them yet. Just know that Trimble is very aware of how much technology has seeped into every aspect of the soldier’s life, and it’s our commitment to bring forward the products that will continue to increase efficiency and safety in their everyday work.